This video from Nuba Reports contains images of injured people. 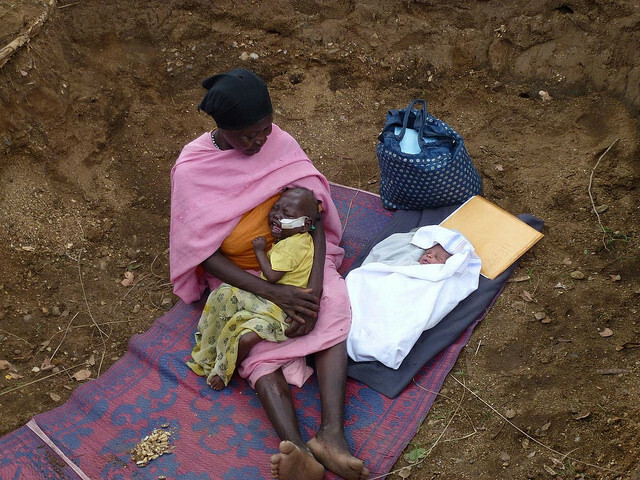 Bishop Emeritus Macram Max Gassis of the Diocese of EI Obeid has strongly condemned the deliberate targeting and bombing of the Mother of Mercy Catholic Hospital in the Nuba Mountains, South Kordofan, Sudan, on 1-2 May. The hospital is supported by Caritas Internationalis and in particular Caritas members Trocaire and Secours Catholique. Bishop Gassis said, “The bombing is an outrage against innocent civilians who are seeking medical assistance from our hospital. The sick have nothing to do with the conflict that has devastated the Nuba Mountains since June 2011. They are innocent civilians protected by international law from direct targeting by military forces. The hospital is the only functioning hospital in the Nuba Mountains of South Kordofan State, which provides essential care and a variety of support services to over 150,000 people annually. The bishop fears for the safety and well-being of hospital staff and patients, and communities living in fear of this very real threat of indiscriminate aerial bombardment. After Church hospital bombed in Nuba Mountains in Sudan, some of the weak had been placed in fox holes in case the plane returns. This mother delivered a healthy baby yesterday. Her older child is admitted for malnutrition. Credit Diocese of El Obeid. I was in the office with Sister when the plane came. There was about a 2 second warning between hearing the plane and the bomb falling – only just enough time to get down on the floor. The office shook with the impact and our vision became blurry with the dust and bits of cement flying in the air. The bomb had hit about 50m outside TB/Leprosy village. As soon as the blast was over Sister and I ran out. I headed straight for a fox hole as did the rest of the hospital population – those that could move. Sister acted less selflessly and started directing people in the right direction, calming mothers who could not find their children, and also opening the back gate so that people could get out and away from the hospital. Then the plane came again, and it was so low – we could see into its underbelly. A bomb hit 30m from the doctor’s House. Once the plane was gone, we shook the dust of and started moving around. Patients were fleeing the hospital in droves, some still attached to their IV fluid bags. We started walking around to see who was left. And that was a sad sight; those that are too sick or too weak to move, those that live to far away and hence have nowhere to go. Thankfully there was only two minor shrapnel an injury from today’s bombing. There is no significant structural damage to property – but many repairs will be required in one way or another; for example many of the doors and windows of the male nurse quarters are blown out, all doors of the doctor buildings are ruined and the roof is in bad shape, plus of course the section of our fence. “I wish to appeal to President Omar EI Bashir, whose air force carried out this bombing, to ensure that our hospital is protected from further bombing. The Mother of Mercy hospital is a Catholic Church health institution which offers life-saving services without distinction based on religion, tribe, or political affiliation,” said Bishop Emeritus Macram Max Gassis. Bishop Gassis said that the Diocese of EI Obeid is committed to peace in South Kordofan. He appealed against the continued use of indiscriminate aerial assault. The bishop said all parties in the conflict needed to commit to peaceful dialogue so that a just and peaceful solution could be found.